AT least 10 crocodiles live on the Palmer Sea Reef golf course at Port Douglas. Wildlife authorities have warned golfers at a course in tropical north-east Australia to beware of three crocodiles up to 3m long -- that have taken up residence in the waterways. A night-time survey of the saltwater crocodiles on the Palmer Sea Reef course at Port Douglas in north Queensland was conducted following numerous sightings. Last year, a man in his 70s was bitten on the leg after disturbing a 1.2m crocodile on the eleventh hole. Dr Matthew Brien, from the Queensland Environment Department, said the crocodiles did not need to be removed but golfers should take care near the ponds around the course. "Our message is pretty clear -- stay away from the water, don't get your ball, it's not worth your life," he told ABC Radio. Michael Wolveridge, who designed the course, said the layout was intended to accommodate the local crocodiles. 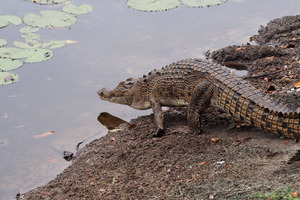 Some players have suggested at least 10 crocodiles live on the course.